"There is no Mr. Smith in Washington. Mr. Smith has been bought." It's ironic that Bob Roberts should be hitting DVD shelves right at the climax of arguably the most pathetic Presidential campaign in US history. Pathetic in the sense that the level of real, earnest choice the American public now has in their representatives has been diluted into capsules of rhetoric and pointless "I'm right"/"No, I'm right" arguments. We hear hollow promises about how all our problems with income, education, and other social problems will simply disappear when X candidate waves his magical stick. 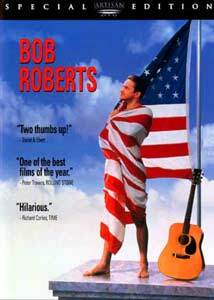 Bob Roberts is a film that slices into the American political system and dissects it for all to see and, though technically a comedy, this 'mockumentary' about a corrupt politician running for the US Senate is far more accurate to the current situation than we may be comfortable with. The film presents itself as a campaign documentary for Senate candidate Bob Roberts, from Philadelphia. We learn about his troubled childhood, when he ran away from his parents to join the military and later emerged as a folk singer. Using his singing career as a major crutch to his campaign, much of his political platform is centered around his music. The songs (the funniest part of the film) are a folksy sort of fascist art, with lyrics that attack most social issues by simply ignoring them or blaming them on someone else. Filmmaker Terry Manchester (Brian Murray) is the documentarian putting the whole thing together, and as he progresses in covering the campaign, he learns all about Roberts' sordid history: his manager was part of the Iran-Contra scandal and his scheme to help the sick and needy, 'Broken Dove', was, at one point, a covert operation to smuggle drugs into the country. Manchester doesn't care about these things—but fanatic journalist Bugs Raplin does and he assaults Roberts every chance his gets. Of course, there are no answers to his questions and his probing into Roberts' shady past is called "unobjective journalism." Bob Roberts' opponent in the race is his political opposite, Brickley Paiste (Gore Vidal). Paiste, though I abhor modern political verbiage, would best be described as a the classic 'liberal' politician. He's certainly likable enough, but his campaign runs out of steam when he's accused of having an affair with a 13-year-old girl, a story undoubtedly engineered by Roberts. The film compares with Spinal Tap in that it's presented in the same way. While most of the film has humorous undertones in the way it makes fun of Roberts' ridiculously fascist ideals, writer/director/star Tim Robbins simply got everything FAR too correct. I saw Bob Roberts when it first released. Back then, it was funny to a certain extent, but nowadays it hits much too close to home. Other than his folk singing, Roberts is interchangeable with almost any major party Presidential candidate in the last decade. This makes the movie very disturbing and dark, but I'm not criticizing the film—It's not like Tim Robbins could have thought times would get sad enough that his vision of an extremist politician would turn out to be the status quo. Though I like what the film has to say, my central complaint would be the heavy-handed and one-sided portrayal of many things. The film seems to specifically slam so-called 'conservative' politicians, yet tends to portray Brickley Paiste as far too much of a hero. In reality, bad politicians come in all shapes and sizes, party or label affiliations making no difference. Regardless of the fact that I found Bob Roberts more disturbing than funny, I can't fault the style applied. Robbins should definitely make a sequel to this film; I'd like to see what Bob Roberts has been up to since 1992. Image Transfer Review: The full frame image is accurate to the original aspect ratio, but is slightly grainy and muddy. This is probably due to the fact that the majority of the film was made with handheld cameras and purposefully low-budget filmmaking techniques to enhance the "docu-look." There are no transfer problems, such as artifacts or pixelization though, and nothing to complain about. Audio Transfer Review: The Dolby 2.0 Surround audio is basically Mono for the most part, with the majority of dialogue and sound effects being center channel oriented. The only portions that really kick in the front channels and surround speakers are the singing and musical portions, which sound very nice. Bass is handled well to add a thickness to the sound, and considering the dialogue-oriented nature of the film, the center channel usage won't really disappoint. Extras Review: A total of 3 commentaries are found on this disc. The first one features Tim Robbins discussing the film. It's a good commentary with informative anecdotes, but Robbins sounds a little like he'd rather be doing something else. The second commentary is supposed to be Tim Robbins and Gore Vidal, but—call me crazy—I don't recall hearing Gore Vidal anywhere in it. Maybe I blinked or briefly went out of the room and missed it, but Gore Vidal just isn't there. However, Tim Robbins is far more excited and energetic about doing the commentary than on the first track, so it's arguably the better of the two. The third commentary has political writers Alex Cockburn and Jeffery St. Claire discussing the film together. While it's an interesting commentary, they seem to spend more time talking about the problems of the Reagan/Bush era of Presidency than focusing on the film. That's their job, though, so I guess that's OK.
A lengthy reel of deleted footage presents mainly alternate versions of scenes from the film, edited in different ways and such. Some of the material is really good and should have been kept in the film, but I'll assume there was a good reason for deleting it. The quality of this footage is far more deteriorated and rough than the actual movie itself. There is a photo gallery of on-set activity as well as some photo stills right from the film. This is offset by a 'direct video' access feature that allows you to view some of the full-length songs as featured in the film, like Drugs Stink and I Want To Live. The original trailer, 2 TV spots, and some good cast/crew bios round off the package. If anything on this release deserves major applause, it's the presentation. While the packaging is fairly basic, the menus are totally themed to Bob Roberts as if it were a real documentary. The scene selection is called "Timeline" and each section is made to look like newspaper clippings with a brief description of the scene as if it were real news. The menu for the bonus features is made to look like political coverage, including constantly changing election statistics at the bottom of the screen for fictional Senate candidates. Fake ads for Roberts' records are also scattered about the menus. Bob Roberts isn't for everyone, and might even offend some people, but it certainly is a very accurate depiction of many problems in modern politics. It also has a wry, humorous edge that, though not as good as I'd want, still makes everything very strange. You'll also have a lot of fun spotting all the various cameos featured in the film. Highly recommended.